Robot Mag has been sharing a passion for all things Robotic since 1996, the very beginning of the modern era of consumer robotics. 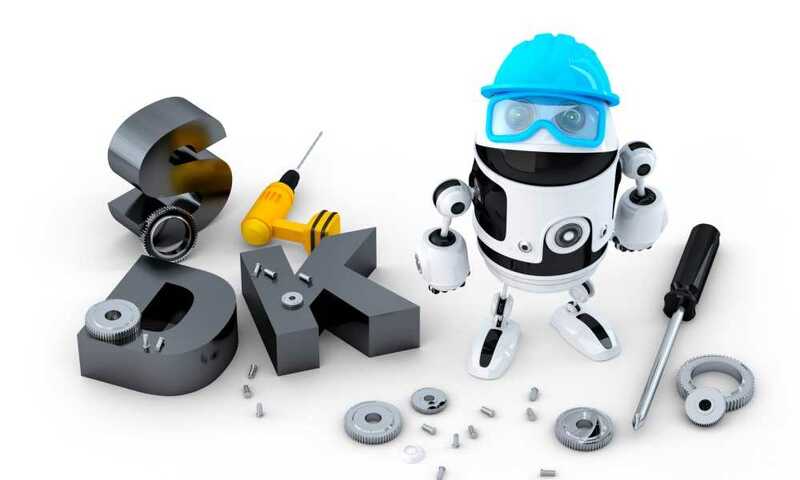 Fast forward to today, and it has never been easier to create a technologically advanced creation at home, and the capabilities of home-built and deployed systems are growing exponentially. The internet and advances in electronics and production have joined forces to make robotics as affordable as it is fascinating, and accessible as it is rewarding. 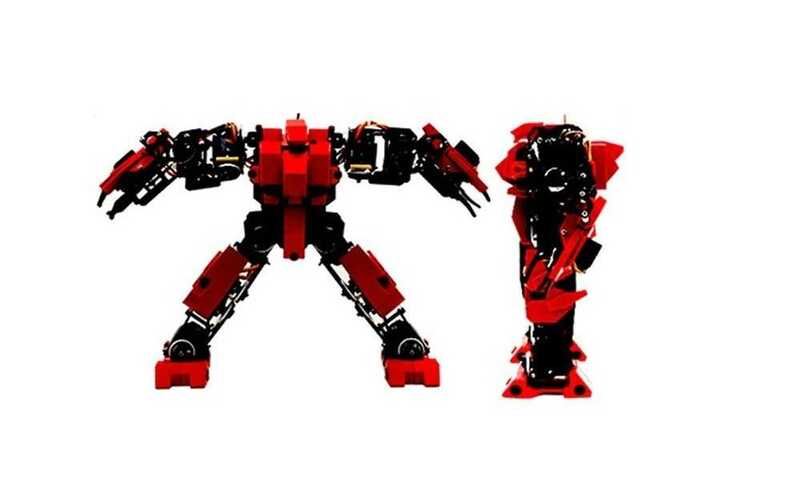 There are a wide range of amazing robot kits for adults, hobbyists and enthusiasts that can be bought online. No more having to extensively plan what to do and accumulate various parts to try out because you can already get a ready-to-assemble kit online! With just a few taps and clicks, you can already enhance your passion for science and engineering. The best thing about the available robot kits for adults is that there’s so much to choose from. They vary in how their finished products look and they have different difficulty levels, ensuring that you’re always challenged whether you’re a beginner or an advanced kit-builder. 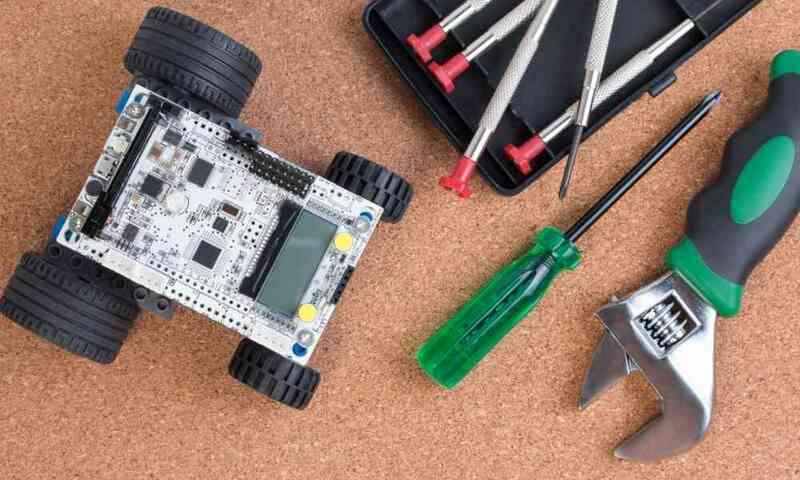 Perfect for hobbyists who love to build things with their own hands, robot kits can be one of the most exciting gifts you can give to anyone who has inclinations towards science, engineering, and automation. These products will surely tickle their fancy and will even help them learn more and maybe even pursue their passion for this field. There’s a huge price range for these kits, so setting a budget to help you narrow down your options. Prioritize the skill you want to enhance. Different robot kits for adults are designed to develop various skills. Determine which one you want to work with so you can pick out the right kit for your needs. Consider how you’re going to control and power the robot. Will your robot be iOS, Android, or PC-based? Do you want one that’s battery-powered or USB-rechargeable? These little details matter as they can have an impact on the ease of your robot’s use and operation. Get a Robot kit that suits you. If this is the first time you’re building a robot, go for a kit that’s made for beginners or intermediate-level builders. If you’re experienced in the field already, go for something that will challenge you further. To help you choose the right kit for you, here are some product suggestions that are worth considering. 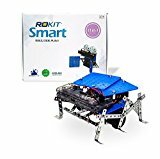 Rokit Smart started out as a Kickstarter campaign aiming to distribute a robot kit that can easily teach the public the basics of robotics. 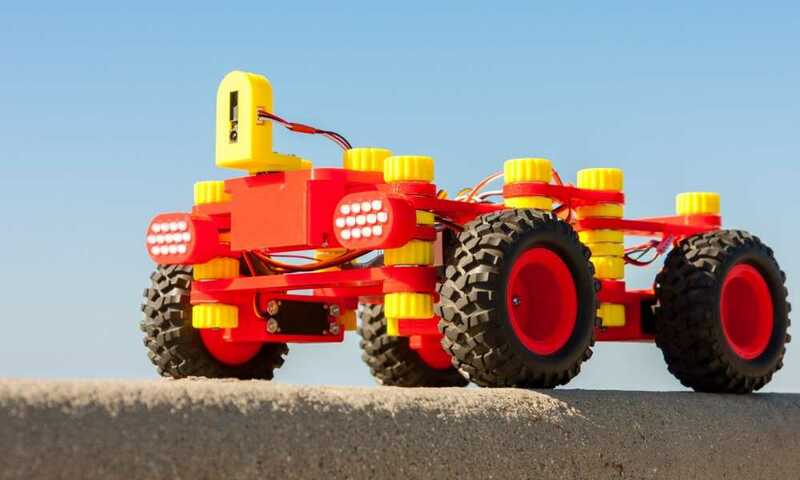 The design has been used for years to teach kids in San Diego how to build and program their own robots. Today, it is one of the most popular kits to get if you want your own versatile and exciting robot a home. 11 robot types in 1 package: line-following robot, edge-detection robot, rubber band gun robot, and interactive game robot among many others. A programmable robot using the Arduino platform. Designed for easy wiring and no soldering involved. With a tabletop design that can be configured in 12 ways. 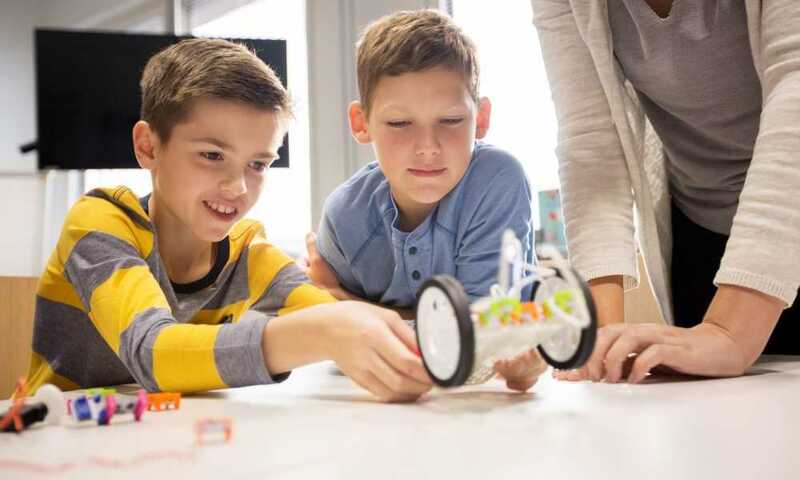 Great for both kids and adults who want to get to know robotics better. It’s very easy to put together. As it doesn’t require any soldering, you can wire the whole thing together without a fuss. This also makes it perfectly safe for young kids. It can be used by kids as young as eight years old. There are so much you can do with this robot so you won’t ever be bored with it. The Arduino platform is easy to understand and master so you don’t have to worry about the coding part. This robot is picked as the official equipment of the California-based Robotics Learning Center, Robolink, for teaching robotics to young kids. 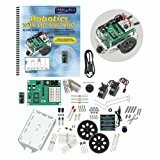 Manuals and tutorial videos are included in the package to help you get started building the robot right away. You’ll need to find a more efficient way to store the small parts to make sure you don’t lose them. The Rokit Smart is considered as one of the best robot kits for adults because of all the capabilities it has and the freedom you have in configuring the robot. It might be very basic, but it certainly doesn’t look like a kiddie robot kit that most adults will shy away from. The Rokit Smart looks like a fancy robot that’s built in a lab, so it certainly adds charm to its great features. OWI robots skyrocketed to fame thanks to its award-winning OWI Robotic Arm Trainer. However, due to its steep price and sophistication, it wasn’t easy to make it readily available to the market. So, the OWI Robotic Arm Edge was born. The two units have a lot in common. The major difference is that the Robotic Arm Edge is more affordable than its predecessor. 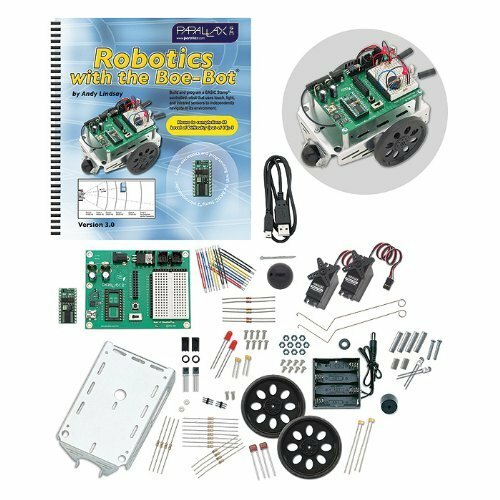 Brimming with capabilities, this robot kit is a great option for beginners of all ages. Robotic arm design that can move in different ways: the gripper opens and closes, the wrist moves in 120 degrees, the base rotates 270 degrees, and the elbow can reach up to 300 degrees. Total command and manipulation are up to the user. Ready to use and control with a remote straight out of the box. Upgrading its capabilities can be done through USB interface and software. Assembly is very easy. You can definitely put this kit together in less than an hour. 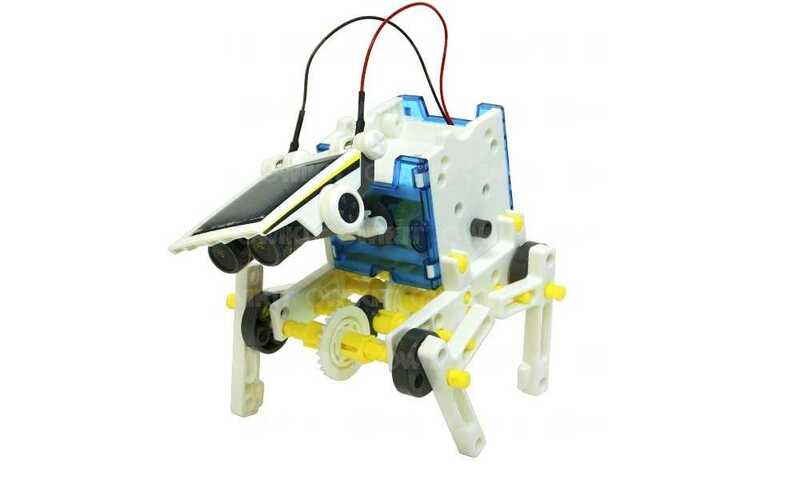 Instructions on how to modify this robot can be easily found online. These tweaks can add more functionalities to this robot, letting you get more out of an excellent toy. Has a very friendly price. Ideal for kids 9 years old and above. It looks sophisticated but not daunting. Choking hazard with many small parts. No auto-shutdown so you need to make sure it’s turned off after every use. No sensors so you should be careful not to turn it too far and out of its range. The batteries and software aren’t included with the unit. 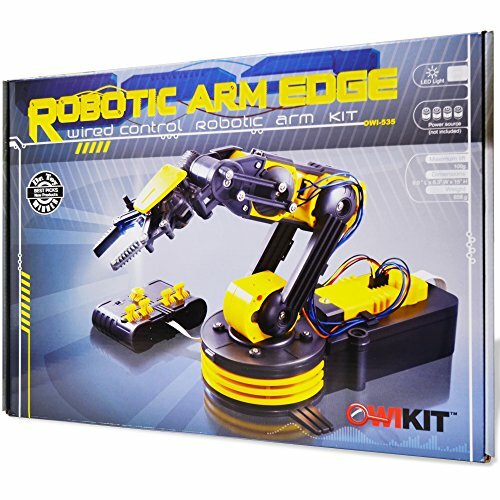 While the OWI Robotic Edge is a great robot kit for kids, it can also be an excellent starter pack for adults who want to have fun while learning the basics of robotics. Its design isn’t overly kiddie and while it’s quite simple to work with, you won’t get bored with it. Tutorials on how to do additional tweaks are also available online, so you’ll always find new ways to enjoy this robot. This makes it a more attractive option since it is already very affordable to begin with. Clueless about electronics and coding but still interested in giving robotics a shot? The Parallax-28832 Programmable Boe-Bot Robot Kit is a great product that you should check out. This rolling robot will let you enjoy creating a robot even if you’ve never tried programming or handling electronics before. This product features the BASIC Stamp 2 Microcontroller brain which will allow your robot to have a complete system without a fuss. 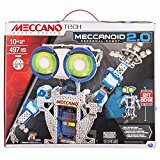 You can program various functionalities and activities for the robot, letting you get so much out of this educational toy. 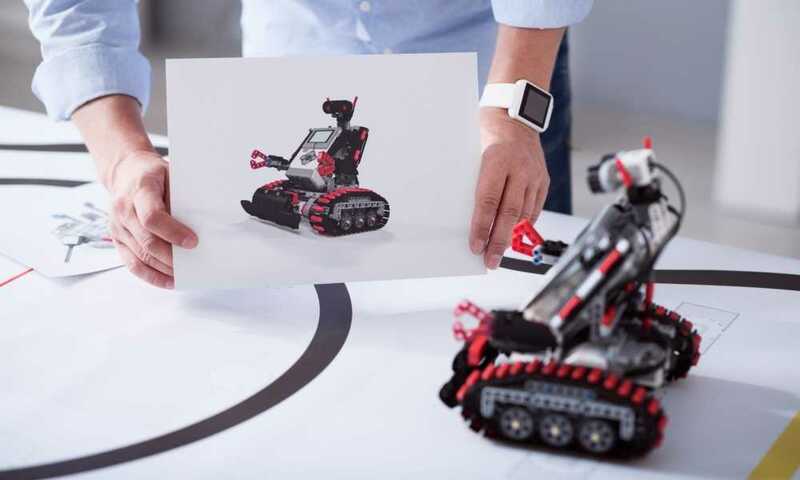 Rolling robot design that can still be configured in so many other ways thanks to its USB-compatible Board of Education. BASIC Stamp 2 microcontroller brain makes it capable of doing so many things. PBASIC programming to add more functionalities and activities for the robot. Equipped with infrared, touch, and light sensors, the Boe-Bot can be autonomous and will have no problems on navigating on its own. Its open-platform design will teach you a lot about circuitry and allow you to create some of your own. Tutorials are included in the package. Ideal for kids aged 13 and above. Can get anyone started in exploring hardware development. You can add more parts to this robot to further boost its functionality and help you develop your skills and knowledge in robotics. Additional extension kits are available so you can really customize and do more with this kit. It’s very easy to set up as you don’t have to solder the parts together. Clear instructions in assembling the robot are also available, so you’ll surely be able to put the robot together in under two hours. It’s BASIC Stamp 2 microcontroller brain gives you so much freedom in exploring what you can do with this robot, making it more fun and exciting to have. It can work with a wide array of operating systems including Mac, Linux, Chromebook, and Windows. It’s a bit pricey for a kit that might still need expanding. 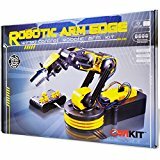 With so many capabilities, it shouldn’t come as a surprise that this robot kit is one of the best in the market today. Building it can even help you earn the Boy Scouts of America Robotics Merit Badge and complete a California A-G approved elective course. 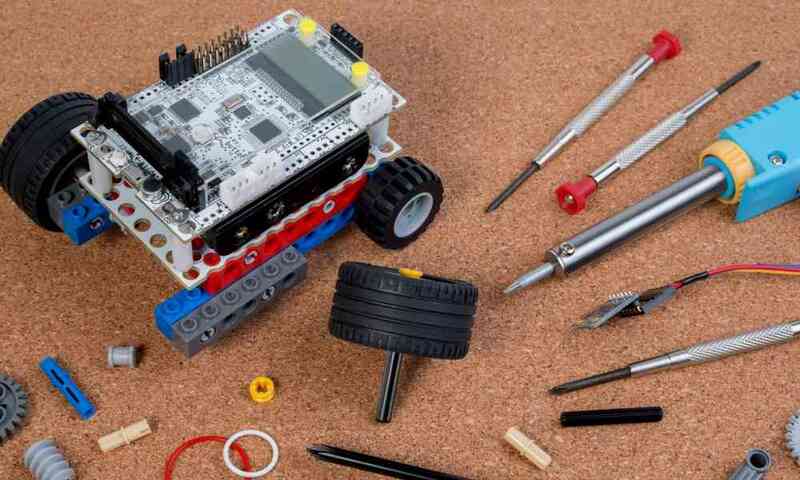 It is, without a doubt, a very educational kit that will teach you a lot about robotics. It’s perfect for adults because it’s the perfect balance between simple and challenging. It won’t need you to know much about electronics and coding, but it will definitely challenge you as it teaches you things along the way. The fact that there’s so much that you can do with the robot once you’ve gotten the hang of it is also a great plus. A lot of adults today grew up watching humanoid robots defending the world from the ultimate destruction. This is why building one would be a great thing to learn how to do. If this is what you have in mind when learning robotics, the AI. Frame Apollo Robot can make your dreams come true. The AI. 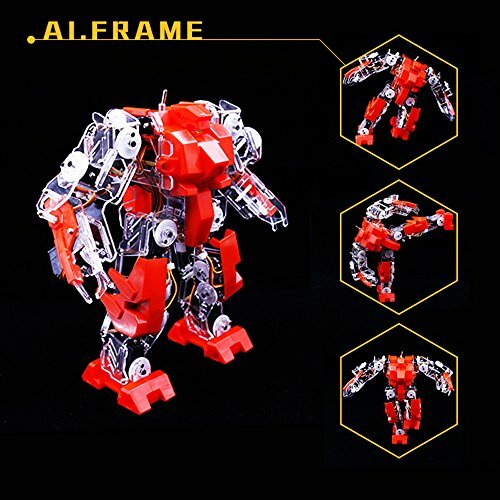 Frame Apollo Robot is a humanoid robot that can do various things. Most of it are quite funny like shooting rubber bands, dancing, walking, and even combatting. It has 10 pre-programmed motions but you can add more as you learn how to tweak its coding. Equipped with 16 plastic microactuators housed in a body made of acrylic plastic. Control of the robot is through its 32 servo controller and an intelligent mobile phone remote control software that will allow you to control the robot with your smartphone. You can also use its graphical editing interface if you don’t know how to program the other control modes just yet. Open source and Windows, Android, and IOS supported, so you don’t have to worry about compatibility. Its sophisticated sensors make the robot smarter than others. You can also purchase additional sensors to further personalize your robot. There are lots of ways how to control this robot. 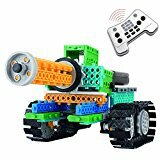 You can use your smartphone, tablet, computer, video game controller, or even get a custom 3d wearable device to make the robot move according to your instructions. Exploring various controls makes this product extremely fun and exciting. There are so many upgrades that you can get for the AI. Frame Apollo Robot that will allow you to further customize and enjoy its use. Available in two varieties: Pre-assembled or Self-assembly. You can choose which one you prefer more. There are so many ways how to personalize this robot. This makes it a lot more than just a toy but as an excellent educational tool as well. It has small parts that are choking hazards so make sure to keep it away from very young children. Some people really got interested in robotics because of the animated and superhero shows they’ve seen as kids. And now that you have the chance to actually own and operate your own robot that can protect the planet from malicious aliens who want to take over the world, why not give it a shot? The AI. Frame Apollo Robot is not just about what the robot can do, but also how it looks. It will definitely bring joy to the kid in you and with everything that it can teach you, you have every reason to try building one. A mobile platform robot will open up a world of possibilities to a hobbyist who is serious in learning robotics. This is why the DFRobot Devastator Tank Mobile Platform is on this list. This robot track platform is the perfect kit for beginners who are planning to do more with their initial robot. 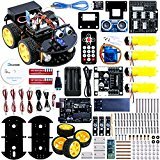 Thanks to its simple design, this robot kit won’t complicate your learning process in building and operating a robot and you have a lot of freedom in customizing and developing the unit into something entirely different. It’s definitely easy to assemble and expand. 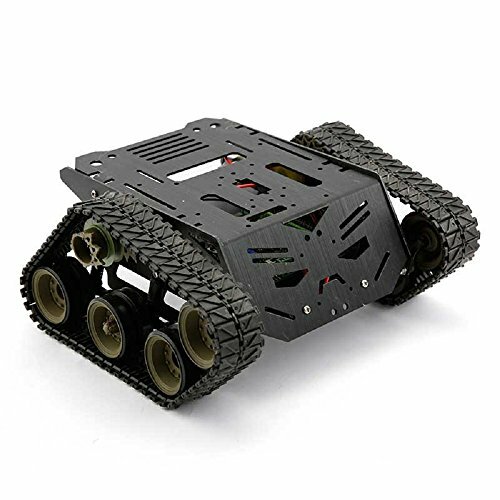 It’s a tank-style robot made with high strength aluminum alloy. Equipped with powerful speed motors and premium tracks making it capable of moving around in different types of terrains. Fully compatible with a wide array of popular programs like Arduino and Raspberry Pi. High-performance suspension and can take up to 3 kg load. Equipped with a heavy-duty body with multiple mounting holes to make accessory attachment easier. It’s very sturdy thanks to its heavy-duty materials. Its tank design makes it pretty easy to tweak and turn into something else entirely as soon as you’ve gotten the hang of programming and designing robots. Compatible with most microcontrollers so you can easily tweak and program without too much fuss. The instruction manual is clear and easy to understand. The tracks are made of plastic. Additional parts that might prove to be useful like ultrasonic sensors and control boards are not included in the unit. The microcontroller does not come with the unit. It requires some soldering and wiring skills to put together. 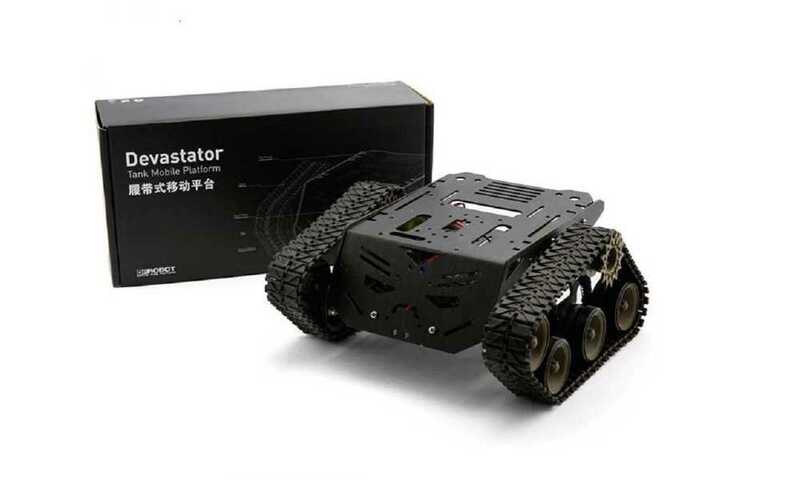 Adults who have prior experience in robotics will find the DFRobot Devastator Tank Mobile Platform a useful robot kit as it allows a lot of easy customization. If you’re planning on creating a specific robot in mind, this product will really help you get started with how to make it move around. Paired with a very low price, it can be the perfect base for your big project. As said before, learning robotics is possible at any age, you just need to find the right tools to do master it. Robot kits for adults can do just that and even more, so if you’re really interested in exploring this field, you should know where to start. The products above are just some of the best robot kits that adults can enjoy. 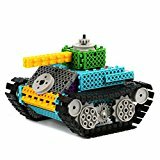 They range from simple kits that even young kids can work with to basic kits that have so much potential for further customization. Take your pick and while away your free time on a fun, exciting, and educational hobby like robot building.